1. 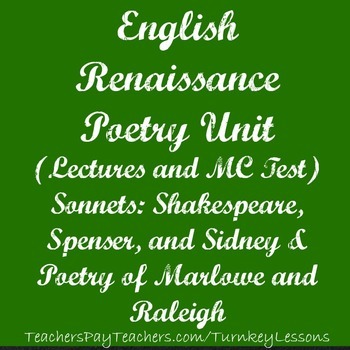 126 slide ppt that walks through sonnet form, brief author bios, and poems (listed below). Check out the preview for the style! 2. 48 question multiple choice test (that you can edit and pull from to incorporate into any assessment). Answer Key included! 3. PDF with a description of how I use this in my classroom, annotated poem notes, and the applicable common core standards. I use this unit in my 12th grade British literature class with my anthology, but all poems are readily available online. I also sell each section (based on author) for $5 each if you are only looking for a small part of this. Individual author packs do not include sonnet form slides like this total package does.